In a flurry of flying bats, Vinny Vampire emerges from his coffin ready to take on the night. If you're looking for a coloring page with just the right amount of spookiness, Vinny's your guy. Later that night, Vinny roams the graveyard, looking for fun. This vampire guy is dressed to impress! Give him some spooky colors to get him ready for a haunting Halloween night. Don't get caught with a vampire who's waking up from a long nap! Give this ghoulish gal some spooky colors, and have a happy and haunting Halloween. This vampire coloring page features Count Dracula, who is very dapper in his suit, scarf, and monocle. 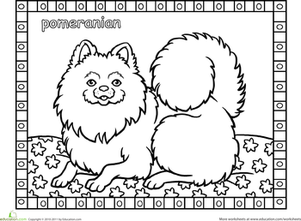 Give him some color for a great Halloween activity! Explore the endless possibilities of color with this color mixing worksheet. Bust out the paints and watercolor to practice creating new shades. Help kids practice spelling patterns with this color-by-word worksheet. Do some addition and color the peacock! Solve the equations and then color by number to reveal a marvelous peacock masterpiece. 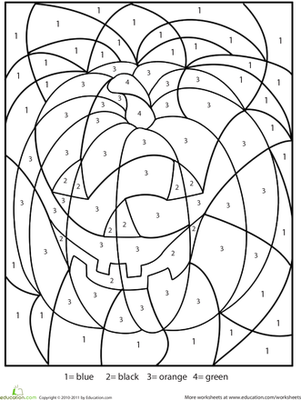 This Halloween color-by-number worksheet has a spooky hidden picture. Color this Halloween color-by-number to find out what's hiding in the numbers. Where do you think this toothy vampire is going on Halloween night? Hopefully he'll stick to Transylvania and not make a last minute trips to your neighborhood!